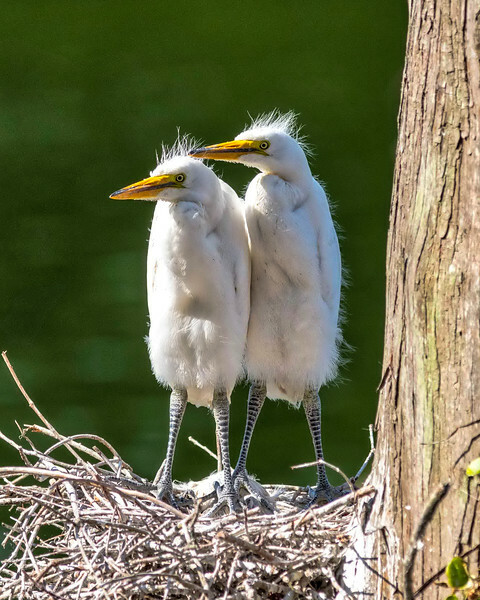 These Great Egret chicks were found at the Ruby Lake rookery located at Shangri La Botanical Gardens and Nature Center located in Orange, Texas. The rookery holds multiple nests of Egrets, Cormorants and the Anhinga. Love this shot of these two, standing there in their fuzzy white coats, giving the mean stare! Perfect shot! Their like "Mom! Dad! Hurry up. We are HUNGRY" This is such a wonderful shot. I love it! Excellent capture. It's so much fun to see the chicks growing up--great fuzzy little heads in the sunlight. Great shot. Love the light to show their little fuzzy bodies! Love it; great light and detail! Wonderful capture! Such beautiful light to highlight the fuzzies on this adorable pair.